Wyoming is home to some of the most spectacular national parks you’ll ever see in the country. From the inspiring rise of Devils Tower to the Old Faithful Geyser in Yellowstone, you’ll fully realize how incredible nature can be. Historically, Wyoming was the first state to give the right to vote to women, which gave the state its nickname of The Equality State. Wyoming has the lowest population density in the country due to its large size and low population, with an average of only 6 people per square mile. With so people in the state and such amazing scenery, it's no surprise that Wyoming has a very high average safety rating for its cities. 20 of the 25 safest cities in the state have a safety score of at least 80, significantly higher than most other states. 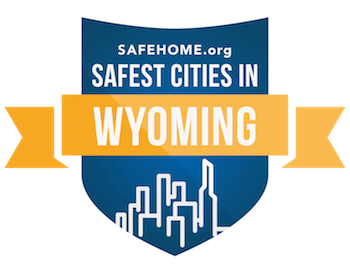 Only two of the cities rank in the top 500 safest cities of the nation, as most of the cities in Wyoming to meet the criteria to rank nationally (i.e. low population). Most of the cities can boast zero incidents of robbery, as well as declines in property crime rates. Quite the feat as well due to cities in Wyoming already having very low property crime rates. Thermopolis is the safest city in the state, with a safety score of 98.46. This town’s economy is mostly based on tourism, as it has the largest hot spring in the world, and is not far from Yellowstone National Park. It is a relatively small town with 3,024 residents. There were no reports of murder or assault here, and a 45% decrease in property crime rates. This is such a safe city due to being a tourist town, and the tourists attracted to this town are the more outdoorsy type rather than partiers that can get out of control. There is not a major city in Wyoming with a sprawling suburbia like in other states, so the safest cities will be spread out all over the state. There is Kemmerer (93.53) near the Utah border and its capital Salt Lake City, and Glenrock (91.54) towards the eastern side of the state. Cheyenne is one of the largest cities in the state with a population of 63,619 and safety score of 73.91. It is in the southeast corner of the state, close to the Colorado border and a short 90 minute drive to the major city of Denver.